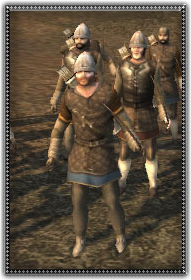 Beginning in lowly origins, these levies have risen to the soldier class with the help of accurate archery skills. Levy archers have a European style iron helmet and an improved, sturdy bow. They hope to overwhelm an enemy with well aimed volleys before they draw in too close. These men excel at defending the frontiers of newly conquered regions, but hope to the Lord they don’t see cavalry.